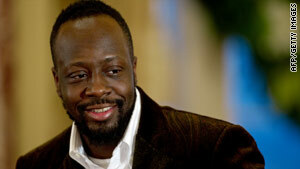 Haitian-born musician Wyclef Jean said: "Did I ever use Yéle money for personal benefits? Absolutely not,"
The Haitian-born musician became emotional as he denied accusations that he misused funds from his charity, Yéle Haiti. Experts on nonprofits said they saw no evidence of serious wrongdoing, other than slowness in filing taxes, CNNMoney.com reported. "Did I ever use Yéle money for personal benefits? Absolutely not," Jean said Monday at a press conference in New York. "Yéle's books are open and transparent, and we have a clean bill of health by an external auditor every year since we started." Jean choked up as he addressed his fellow Haitians in Creole. "I do not cry for myself; I cry for them," he explained, translating for the English-speaking members of the audience. "I tell them, just permit us a little time." Accusations that the charity's funds were misused have come out in the past few days, after its tax forms were made public, CNNMoney.com reported. Donations have poured in since last week's earthquake in Haiti, totaling "several million dollars," Hugh Locke, president of Yéle Haiti, said at the press conference. Jean is scheduled to co-host a Friday fundraiser from New York, with George Clooney in Los Angeles, California, and CNN's Anderson Cooper in Haiti. "Hope for Haiti" will air commercial-free on Hope for Haiti" will air on ABC, CBS, NBC, FOX, CNN, BET, The CW, HBO, MTV, VH1 and CMT starting at 8 p.m. ET/PT and 7 p.m. CT, MTV announced. Here's another example of the frustration faced by volunteers in Haiti. Traynor, a retired international building contractor, e-mailed CNN on Saturday: "I am sitting at Hôpital Sacré Coeur in Milot, Haiti, 75 miles north of PAP [Port-au-Prince] waiting for patients that have yet to arrive," he wrote. "I have a 7 member trauma/ general surgery team that arrived from the States earlier this afternoon and have received only 4 people from PAP. I am told that within three to four days all those injured in the quake will be dead and the extraordinary efforts accomplished by these generous doctors will have been wasted. What in the name of God can we do?" Traynor, from Wilbraham, Massachusetts., originally went to Haiti two years ago with a church group, and saw the need there. He has repeatedly gone back to work with Hôpital Sacré Coeur, most recently arriving a few days before the earthquake. "I'm just a non-medical volunteer. I have background in electrical engineering," he wrote. He was in the process of overhauling the hospital plans, including adding a new wing with a state-of-the-art ER/Trauma center as well as a neonatal unit. After the earthquake, he surveyed damage at the hospital, and determined that the minor damage to various buildings would not affect the work that can be done there. Fifteen patients arrived Monday. The hospital still has room for more than 100 people. Traynor wrote to CNN, "I'm a volunteer who was caught in the earthquake. It came for me, I didn't come for the earthquake." The man who shot Pope John Paul II in 1981 was released from prison in Turkey on Monday, Turkey's Anadolu news agency reported. Agca, now 52, severely wounded the pontiff in Rome's St. Peter's Square on May 13, 1981. John Paul spent six hours on an operating table and survived. Four days later he announced from his hospital bed he had forgiven the attempted assassin and urged the faithful to pray for Agca. The pope spent more than three weeks in Gemelli hospital recovering. Agca was arrested a few minutes after the attack, tried, and sentenced to 19 years in prison. The Telegraph of London, England, reports that, in a statement distributed by his lawyer Monday, Agca said: "I proclaim the end of the world. All the world will be destroyed in this century. Every human being will die in this century." He signed the statement as "the Christ eternal," in keeping with his claim that he is the Messiah. He has never explained why he tried to kill the pope. The Republican former U.S. attorney defeated the incumbent New Jersey governor, Democrat Jon Corzine, in a closely fought contest in November. Christie will be sworn in today as New Jersey's 55th governor. According to his official biography, the father of four was born in Newark and has lived in New Jersey his entire life. It continues, "As the chief federal law enforcement officer in New Jersey, Christie earned praise from leaders in both parties and drew national attention for his efforts in battling political corruption, corporate crime, human trafficking, gangs, terrorism and polluters." During the campaign, Corzine released an ad in which a rotund Christie was shown emerging from a car in slow motion, shortly after the narrator declared the former federal prosecutor "threw his weight around" to get government favors. NJ.com reported that Christie was open and humorous in his response. "He never complained about my weight when I was putting all those people in jail," Christie said during a campaign speech. "He was falling all over himself to take credit for me." Christie said Corzine only decided to run ads mentioning his weight when the polls weren't going in the governor's favor. "Could you imagine what the discussion was around the Corzine conference table when they came up with that one?" Christie said. "The real shocking part is that someone who tries to call himself a leader sat at the front of the table and said, 'Green light that baby, let's go.'" During the campaign, Christie also said the weight issue was irrelevant as his health was not an issue. Beginning today, the state's $31 billion in debt will be. The former Marine began with three hamburger and hot dog stands in San Bernardino, California. A fan of Mexican food, Bell decided to add tacos to the menu in 1951 and sold them for 19 cents each. The New York Times reports that this simple dream led to the chain of 5,600 Taco Bell restaurants around the world that still bear Bell's name. His death at the age of 86 was announced on the Taco Bell Web site on Sunday. The Times reports that the fast-food chain, which Bell sold in 1978, moves more than two billion tacos and a billion burritos each year.